Whether you are after personalised polo shirts to make your staff look sharp or custom polo shirts to use as promotional material, you have come to the right place! Thanks to our handpicked selection of polo shirts, finding the perfect one has never been so easy. Don’t know which garment is right for you? Then get in touch! Our great team of printing experts is always ready to help when it comes to custom polo shirts. Or if you’ve already made up your mind, get a quote! 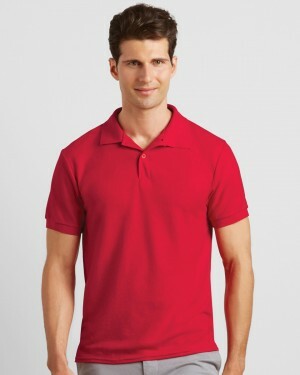 This polo is one of Gildan's most popular products due to its awesome low price. The ultra cotton provides a heavy but soft feel and it comes in a wide range of colours making it ideal for promotional purposes. Fitted style, lightweight polo shirt that looks good and comes at a great price. This product is available in a variety of colours and sizes, making it great for any purpose or event. Ideal for embroidery and screen printing. Personalised polo shirts in the UK are now easy to order, with Printsome! Unlike personalised T-shirts and due to its smooth and professional finish, personalised polo shirts take things up-a-notch and look a little smarter. Polo embroidery is the most common way of personalisation. Custom polo shirts offer the comfort of a T-shirt, but the formality of a button-up. They’re easy to combine, dress up or down depending on the occasion, and they come in all sorts of prices. Embroidered polo shirts UK are a popular choice for businesses, events, teams, and clubs. For Polo shirt printing & embroidery a logo is usually placed on the left breast as a subtle form of promotional clothing. 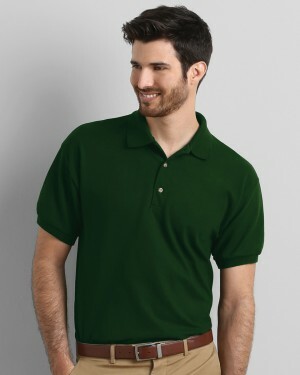 Although T-shirts printed with screen printing are more often associated with event merchandise, embroidered polo shirts are also good for producing in bulk. From our experience with bulk T-shirt Printing & embroidery, we will advise going ahead with it as will help you save time and money. A very popular choice for the modern school uniform is polo shirt embroidery. They are much more practical than the traditional formal school shirt as they’re much easier to move in and more comfortable to wear. The variety of different embroidered polo shirts colours also means mum doesn’t have to worry about keeping a white school shirt pristine! Polo shirts are also a good fit for other printing techniques. However, we wouldn’t recommend DTG printing as the fabric is porous and the design can be disturbed when printed. At Printsome we only work with the highest quality printing techniques that better fit your project, and that’s why we have our team of account managers for. Printsome offers a wide range of polo shirts to suit everyone, including men’s polos, ladies’ polos, kids’ polos and long sleeve and short sleeve polos. Our personalised polo shirts come in a selection of colours and fabrics, including piqué (the traditional textured cotton weave of a polo), DryBlend® (to keep you dry in the important places), heavy but soft feel, with or without side vents and with contoured collars and cuffs. All you need to do is choose which one’s right for your needs. If you are not sure about which to choose, just get in touch! We are an online T-shirt printing agency and that means we do everything for you, from advising on what garment better fits your needs, to doubts about the different techniques we use, and any other questions you might have. Our team of kind and vibrant printing experts will be more than happy to help you with your custom polo shirts. And just a couple of tips on wearing your customised polo shirts: Never wear anything underneath it or you’ll look bulky and overclothed, and never ever pop the collar (turn it up), the polo-style police will be after you in a flash! Most polo shirts fall into two categories: piqué or Jersey. Piqué, as we already mentioned, is a bit stronger and tends to give the garment a bit more of a ‘figure,’ if you will. While Jersey is softer, like a T-shirt, which is why it is usually reserved for outdoor and physical activities. Are you in a hurry? The Good news is here! You have two delivery options and one of them is the express delivery with 2-4 days printed polo shirts delivered. If you can wait a bit more, you have the standard delivery option and within 5-10 days you will have your order at your door. So remember, if you are in search of high-quality personalised garments, Printsome is the option!